The move by the Industrial Left group of unions to join with the right-wing AWU to prevent a slew of resolutions (including one on refugees) being debated at the Victorian ALP conference has left many refugee supporters angry and dismayed. Disgracefully, Labor leader Bill Shorten’s opening conference speech restated his now well-rehearsed line that, “A Labor government will stop the boats”. Before the conference started, the hopes of refugee supporters were buoyed when John Setka, the Victorian secretary of the CFMEU, took the Refugee Action Collective’s “Unions Stand with Refugees” sticker and then made sure that all the CFMEU delegates wore the stickers into the conference. But those hopes were dashed when the CFMEU backed the move to refer the motions to Labor’s administrative committee. The move meant that a resolution to bring refugees and asylum seekers from Nauru and Manus to Australia was not tested on the floor of the Labor conference. For many refugee supporters, it was yet another example of Labor (and the left unions) selling-out refugees. Setka and other Labor leaders seem to think that taking a stronger pro-refugee stand would damage Labor’s chances at the election. They are wrong. Of course, Dutton and Turnbull would try to make asylum seekers a big election issue, but Dutton only scores political points because Labor concedes the argument to him. Kevin Rudd won the 2007 election with Labor promising to close the offshore detention centres. Shorten could just as easily win with pro-refugee policies. The latest Essential poll has Labor ahead of the Coalition by 54 to 46 (two-party preferred). That’s a massive lead. Besides the majority of Labor Party members, consistent polling by the Australia Institute shows large majorities (72 per cent in April 2017) in favour of allowing refugees to settle in Australia (although 35 per cent say their claims should be assessed in offshore detention first). That is a solid level of community support to build on. The fact is that the refugee issue is not itself a vote changer. At the last election it did not rate in the top ten issues of concern to voters. Electorally, that is the reason that Dutton gets away with his refugee-bashing; but it also shows that being pro-refugee would not harm Labor’s chances. There is no reason to believe that Turnbull would beat Shorten, if Labor was promising to close Manus and Nauru. What holds Labor back is the triumph of electoral opportunism over principle. Labor panders to Dutton’s xenophobia in the hope this will maximise its vote. Its commitment to running the system means it wants to ride public opinion into office, not challenge it. Labor’s crisis over refugees has taken another twist with Shorten finally admitting that there are no additional third countries that will resettle those on Nauru and Manus. As the US resettlement deal flounders, Shorten stumbled over questions on Q&A. Shorten tried to distance Labor from the government saying, “I do not believe we need to have indefinite detention.” But he rejected placing a time limit on offshore detention. To get the refugees off Manus and Nauru, Shorten would have to promise to “Bring Them Here”. A majority of people who vote Labor disagree with Shorten over refugee policy. But they are going to vote Labor to get rid of Turnbull. The task for the refugee movement is to find ways to connect with the thousands of Labor members and voters who support refugees, and draw them into action over the issue; action that will be needed to fight a future Labor government. Scores of Labor branches have submitted motions to the NSW Labor conference to shift federal Labor policy to “Bring them Here”. 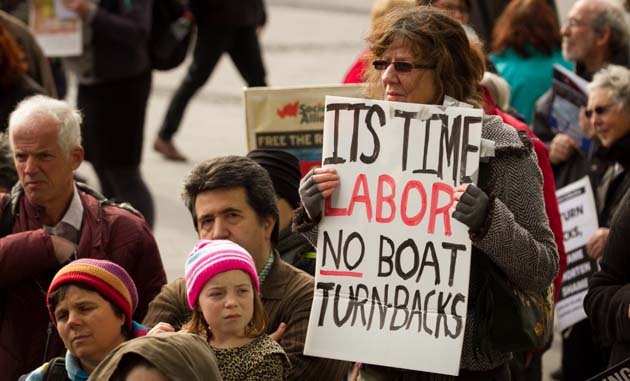 We need more Labor branches and more union contingents on the July rallies marking the shameful anniversary of five years of offshore detention, and the movement’s determination to end it.